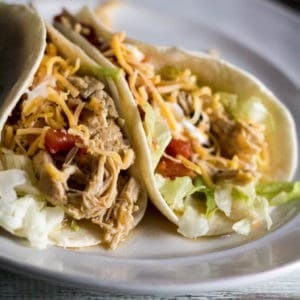 Turn up your Taco Tuesday with this Instant Pot chipotle chicken tacos recipe. 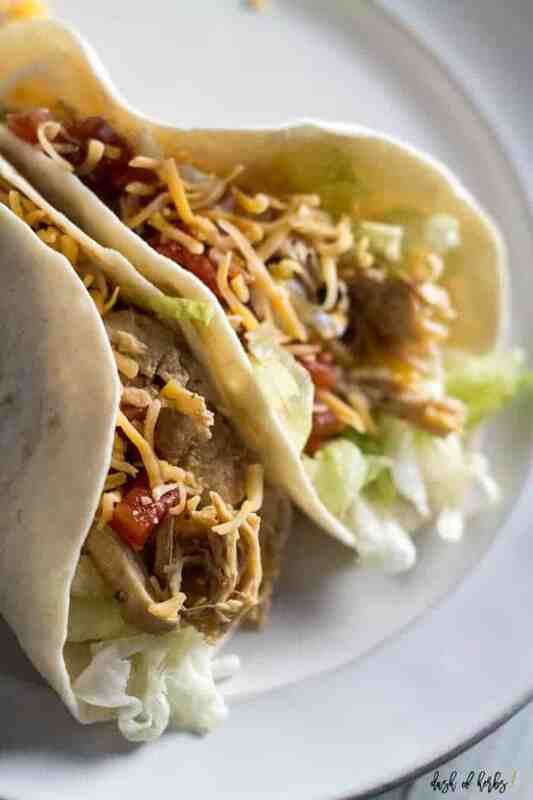 This recipe is packed with flavor (the chipotle chilies will do that), and make a wonderful taco recipe. 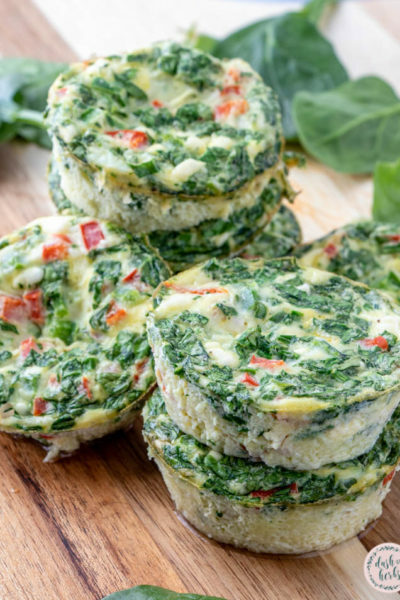 This recipe is only 4 Freestyle points per serving on Weight Watchers. I was a little intimidated to cook with my Instant Pot when I first got it. As excited as I was to use it, I was worried that I would blow something up. I sat and read the manual – and suggest that you do that as well if you are a new owner of any electric pressure cooker. There are safety measures on the device to help this fear go away, but make sure that you feel comfortable. 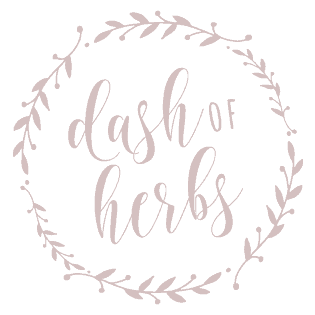 Despite my initial hesitation with using the Instant Pot, it has become one of my most beloved kitchen devices. Why? It’s truly a one pot cooker. I can saute things that need to be pre-cooked, cook chicken in about 8 minutes, and so many other things. If you have ever thought about buying an Instant Pot or other electric pressure cooker, I highly recommend it. While it’s not really “instant”, it can get dinner on the table fairly quickly. With the cooker’s lid off, spray the olive oil spray and heat to “Saute” until the cooker has heated up. Add the onion and garlic and cook until the onion is translucent and the garlic is fragrant. Season the chicken breasts with salt and pepper and place in the Instant Pot and saute until browned. Add the chicken stock, chilies, brown sugar, cilantro and lime juice. Securely lock the pressure cooker’s lid and set to “Manual”. Cook at HIGH pressure for 8 minutes. Perform a quick release to release the pressure. Open the lid and remove the chicken breasts. Shred the chicken and set it back in the cooker. Scoop out 1/2 cup of the chicken mixture onto a 6 inch tortilla. 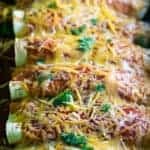 Add lettuce, tomato and cheese (or other toppings), if desired, and serve immediately. 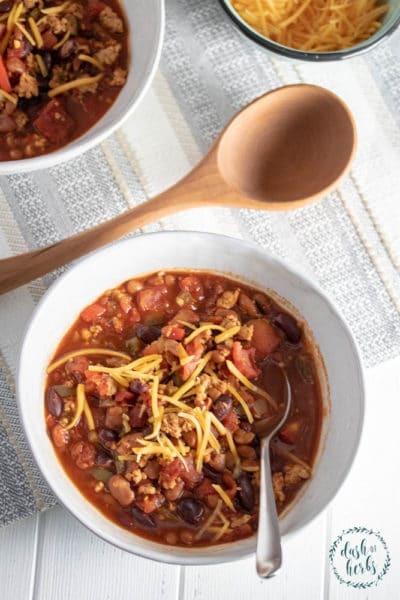 What have you made in your Instant Pot lately? 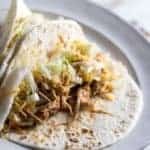 This recipe is 4 Freestyle points per serving on Weight Watchers, 1/2 cup of the chicken mixture on a 6 inch tortilla. With the cooker's lid off, spray the olive oil spray and heat to "Saute" until the cooker has heated up. Add the onion and garlic and cook until the onion is translucent and the garlic is fragrant. Season the chicken breasts with salt and pepper and place in the Instant Pot and saute until browned. Add the chicken stock, chilies, brown sugar, cilantro and lime juice. Securely lock the pressure cooker's lid and set to "Manual". Cook at HIGH pressure for 8 minutes. Scoop out 1/2 cup of the chicken mixture onto a tortilla. Add lettuce, tomato and cheese, if desired and serve immediately. Spray the slow cooker with olive oil spray and place the chicken breasts at the bottom. Add the rest of the ingredients (until the Cilantro) and cook on LOW for 6-8 hours. Remove the chicken and shred it. 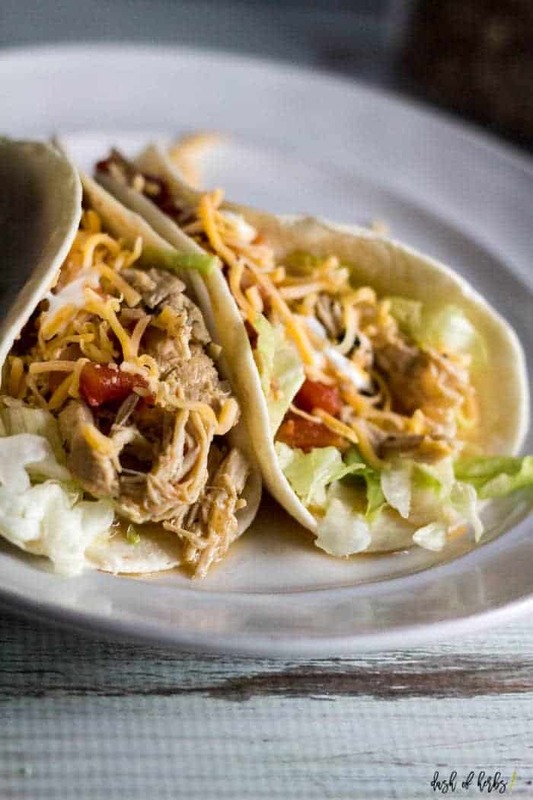 Add the shredded chicken back into the slow cooker and stir to combine. Yes, I believe you could make it in the slow cooker. 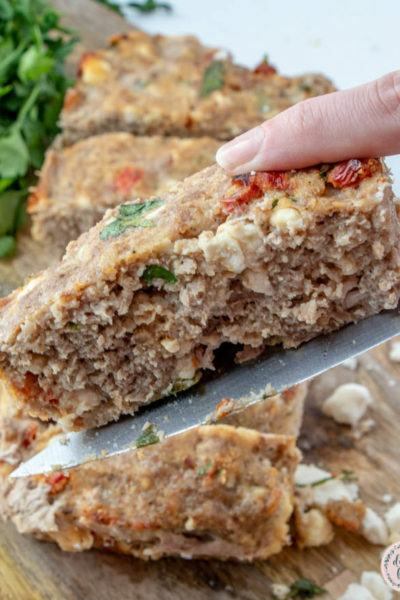 I’ll update the recipe card for this to include a slow cooker option. Thank you – if you use frozen chicken, you might want to up the cooking time a little, but only add 2-3 minutes. It should still come out great even if you use the frozen chicken breasts. Hi there! These tacos look delicious! 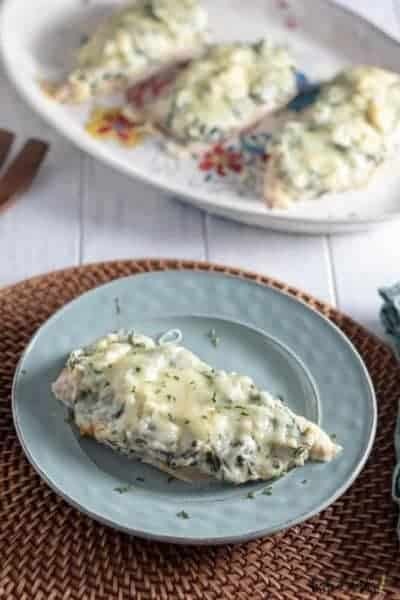 How would I alter the recipe for frozen chicken breasts? Thanks! I would probably increase it a little bit – maybe to 10-12 minutes if you doubled the amount of meat. If I doubled the recipe, would the cook time remain 8 minutes? Yes, most of the points are due to the tortillas. The cheese is 2nd in line to high points, but not a much as the tortillas. Are the points mainly coming from the tortillas? Looks great! No, just brown it a little bit on each side and then it will cook when you switch to Manual mode. You will shred the chicken at the end too, so you don’t have to brown the chicken if you don’t want to. Do you cook the chicken until it is completely done cooking when sautéing it or just brown the sides too keep the juices in? Hi Angela – I used the chilies (canned) in the adobe sauce. I’ll update the recipe card to make it more clear. So sorry for the confusion! The recipe sayschipotle chiles diced. Thank you! I love the Instant Pot…it truly is a game changer – and makes cooking so quick and easy. I am *always* down for busting out my Instant Pot. 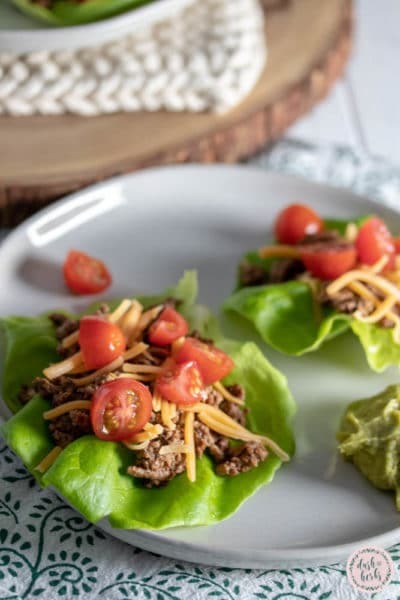 These tacos look fantastic! 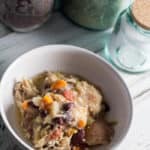 It took me a long time to get on the Instant Pot bandwagon, but I am so glad that I did! 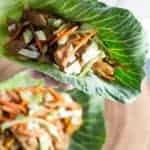 This recipe is easy and the Instant Pot really does make cooking easier. I have GOT to get myself an instant pot. 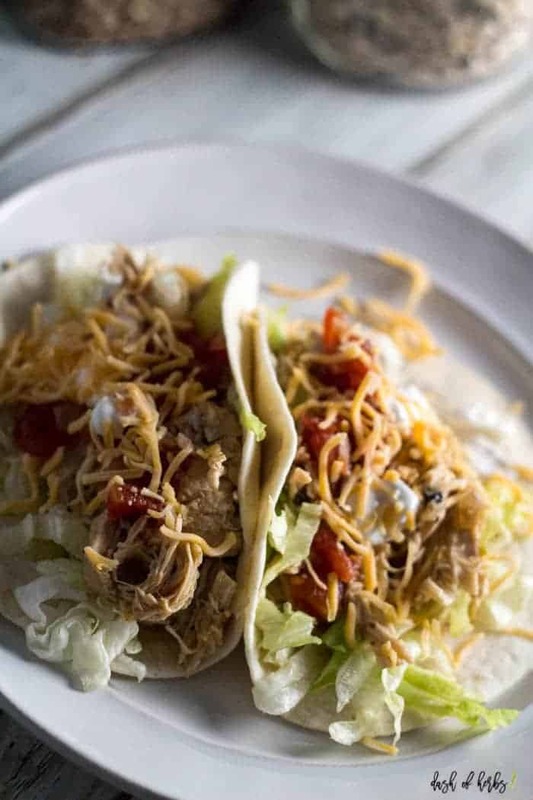 This chicken taco recipe has cinched it! Wonderful recipe. Can’t wait to try it! Thanks Rachael! They are delicious and pretty easy to make. OMG these look sooooo good! !